Imec, the world-leading research and innovation hub in nano-electronics and digital technologies, presents this week at its technology forum ITF 2018 (Antwerp, May 23-24), a novel organ-on-chip platform for pharmacological studies with unprecedented signal quality. 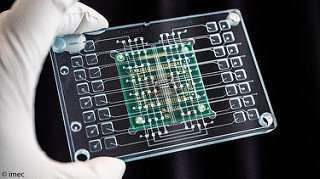 It fuses imec's high-density multi-electrode array (MEA)-chip with a microfluidic well plate, developed in collaboration with Micronit Microtechnologies, in which cells can be cultured, providing an environment that mimics human physiology. Capable of performing multiple tests in parallel, the new device aims to be a game-changer for the pharmaceutical industry, offering high quality data in the drug development process. Every year a handful of new drugs make it to the market, but in their wake tens of thousands of candidate drugs didn't make the cut. Nevertheless, this journey will have taken a decade and costs billions. The fact that drug development is so time-consuming and costly, is because of the insufficiency of the existing methodologies for drug screening assays. These current assays are based on poor cell models that limit the quality of the resulting data, and result in inadequate biological relevance. Additionally, there is a lack of spatial resolution of the assays, resulting in the inability to screen single cells in a cell culture. Imec's novel organ-on-chip platform aims to address these shortcomings and challenges. Imec's solution packs 16,384 electrodes, distributed over 16 wells, and offers multiparametric analysis. Each of the 1,024 electrodes in a well can detect intracellular action potentials, aside from the traditional extracellular signals. Further, imec's chip is patterned with microstructures to allow for a structured cell growth mimicking a specific organ. "By using grooves, heart cells can for example grow into a more heart-like tissue. In this way, we fabricate miniature hearts-on-a-chip, making it possible to test the effect of drugs in a more biologically relevant context. Imec's organ-on-chip platform is the first system that enables on-chip multi-well assays, which means that you can perform different experiments or – in other words – analyze different compounds, in parallel on a single chip," explained Veerle Reumers, project leader at imec. "This is a considerable increase in throughput compared to current single-well MEAs and we aim to further increase the throughput by adding more wells in a system." "Altogether the platform is a big step closer to mimic a real heart without using animals," added Reumers. "Add to this the significant increase in throughput and the intracellular resolution, and it becomes clear that our device heralds a new-generation of drug screening tools for the pharmaceutical industry."